A school yard 6 by 4 meter analemmatic dial of pigmented concrete. The Sunclocks registered design has two hour ellipses, the outer one for standard time, the inner one for daylight saving time. The zodiac table is larger for the fall and winter periods so the design is really two sundials in one. Longitude correction is included. The plaque provides instructions in French and English and notes the dial marks the 50th anniversary of Ecole Banff Trail. The plaque instruction to stand on the current month is misleading; the user should straddle the dial centerline to avoid an offset error. A 9 inch diameter horizontal dial of Welsh green slate with brass gnomon. Hour lines show DST with longitude correction. Declination lines are shown for solstices and equinoxes. The gnomon includes a NASS logo. The dial sits atop a stone plinth with 12 inch diameter top. The original Sundial of Hope, sponsored by Child Find of Alberta, was placed in 1993 on an original plinth dating to before WW2. The simple dial installed in 1993 had been vandalized and the gnomon was missing. Roger Bailey designed and built this replacement dial to commemorate the 10th Anniversary of the founding of NASS. The new dial was unveiled during the 2003 NASS Conference Sundial Tour. An analemmatic dial with 14.8 foot major axis of concrete, pebble and rock with cast concrete hour markers. Hour lines are longitude corrected and mark DST. A Zodiac date line of colored concrete is inlaid on the dial face. Seasonal markers for sunrise and sunset are included. An analemmatic dial with 14.8 foot major axis with hour posts and date line of concrete on a grassy playground. Date line includes footprints of cut aluminum. A steel and brass equatorial dial 49 inches in diameter. The dial simulates an armillary sphere with two crossed semi-circles in a modernistic sculpture. There is a slot in the gnomon that projects a sun line and corrects for the equation of time; the gnomon is turned over at the solstice. Fine adjustments are required near the solstice to show correct clock time (MST). Dial built as a Canadian Centennial Project. Now relocated to a mid-level landing on the entrance stairs but not correctly aligned, producing a 48 minute error. Stone analemmatic dial designed by Kasian Kennedy. Dial is laid out in a circle. Monthly markers designate where observer is to stand to act as the gnomon. Both standard and DST hour marks included. A horizontal dial of varnished wooden shaped as octagon, perhaps 24 in. across, 2 in. thick, with very thick wedge-shaped gnomon. Roman numerals carved at ends of hour lines. Dial sits atop a segment of tree trunk. 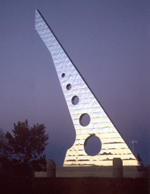 This monumental stainless steel sundial was built as part of the Grande Prairie Millennium Project. The beautiful gnomon is 12m (40-feet) tall and symbolizes the passage of the year 2000 into the 21st century. Behind the visible stainless steel cover of the sundial's gnomon is a one by two foot steel beam. Engineers adopted computer programming techniques to construct and align the 30 centimetre thick gnomon of the Centre 2000 sundial. Specific factors such as the city’s elevation, its latitude and correction longitude mark time with the region’s Mountain Standard and Daylight Savings Time. One of the largest horizontal dials in North America. Dial is 197 feet in diameter. It's location is on the 4th meridian at 110:0 west, a line that separates Alberta and Saskatchewan and divides the city of Lloydminister in half. (Lloydminister began as a single town in 1903, but was split in 1905 with the survey that created Alberta and Saskatchewan. The town remained divided until 1930 when by joint decree it was amalgamated back into a single city).